If you haven’t read my previous post, I suggest that is the first place to start! The first 4 days of my amazing Alaska cruise were some to remember, but what came next were just as good… if not better! Skagway day! 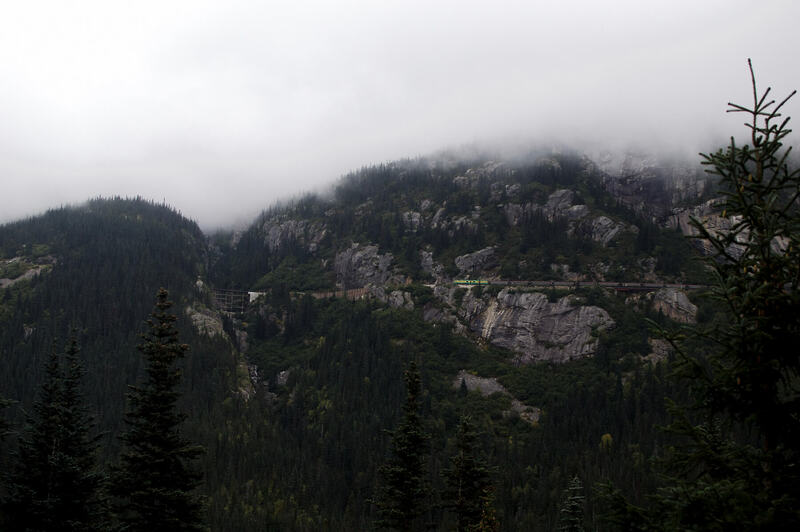 This very small town has the most scenic railroad in Alaska – The White Pass Summit Scenic Railroad is an International Historic Civil Engineering Landmark; reaching the summit at 2,865 feet and crossing the border into Canada. 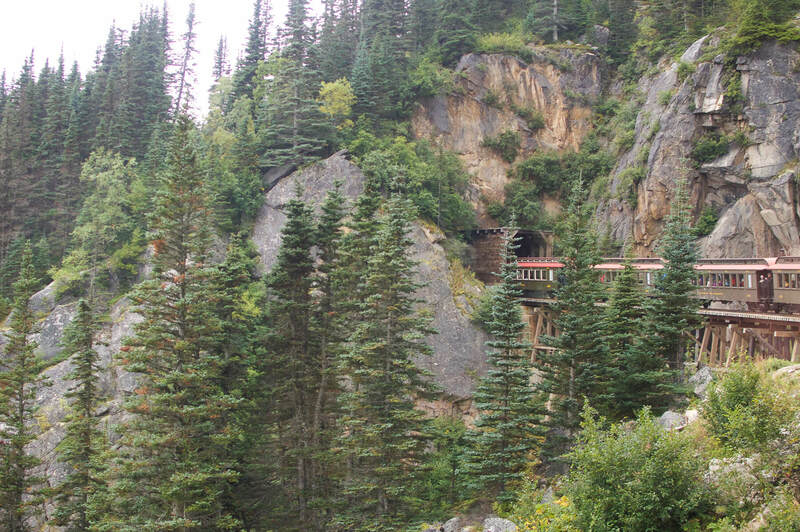 On this railroad built in 1898, you will see old mining works, century-old trail, cemeteries from decades ago, broken down bridges and breathtaking views. Each carriage on the train has its own wooden fireplace, how cool is that! A definite must do if you ever visit Skagway. The entire journey was a 3-hour round trip that disembarked directly out the front of the ship terminal. You could decide on the time of the excursion when purchasing the ticket and boarding the train was a piece of cake. The train travelled along the sides of mountains, through pitch-black tunnels, down into valleys and above beautiful creeks. 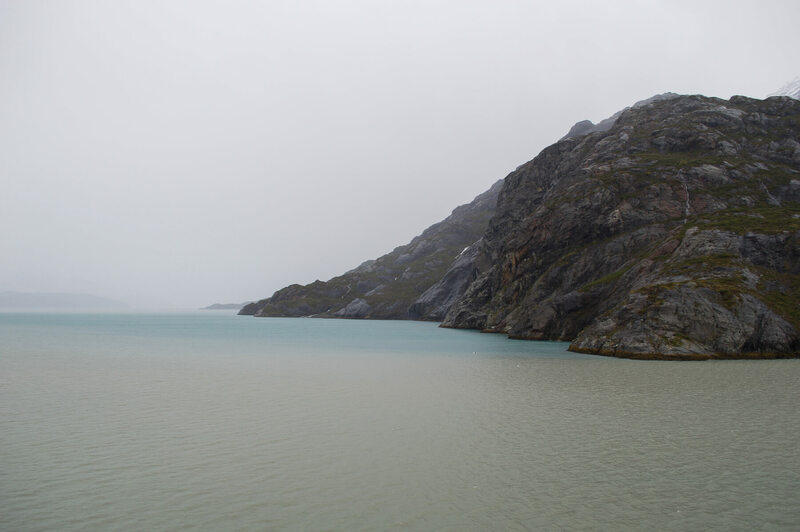 Unfortunately, the day we travelled was very cloudy, so we didn’t have the best views of the surrounding mountains and glaciers… But it was an amazing experience nonetheless. 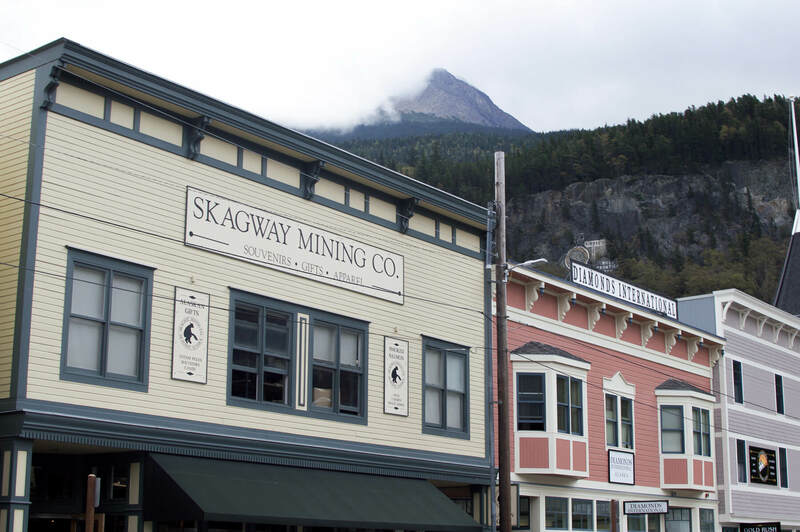 The town centre of Skagway felt as though you were walking through the Wild West. It was characteristic, colourful and the most lively of all stops on the cruise. It was a very small town but had a bucket load of shopping, entertainment and even a brothel tour – if that’s what you’re into. Not many restaurants or food for vegetarians though, but hey… Nothing’s perfect! Glacier Bay. A day I will never ever forget. 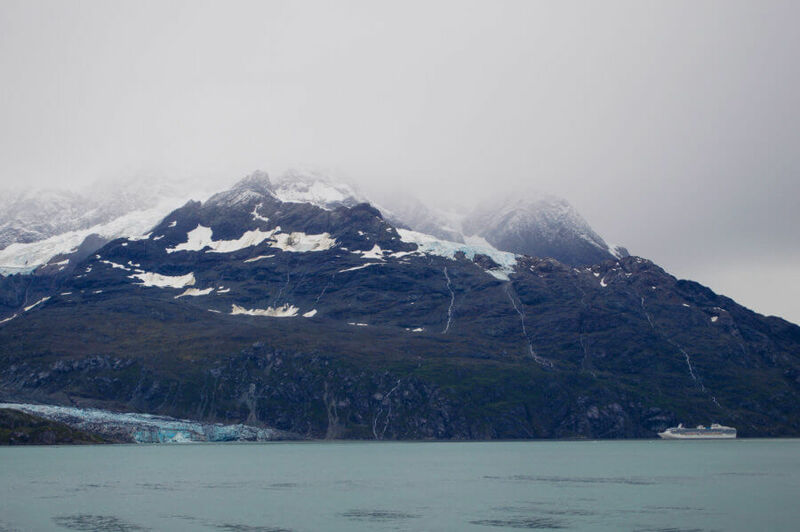 Before the crack of dawn, we were inside of Glacier Bay National Park; a place so picturesque it left me lost for words. 2 of the Park Rangers boarded the ship from a small dingy before we woke, and were on board to give commentary and information on the glaciers, wildlife and surrounding landscapes. You could listen to them anywhere on the ship; through the TVs, speakers or live on the stage. They gave us non-stop information about the things we were seeing across the 3.3 million acres of rugged, untouched terrain. 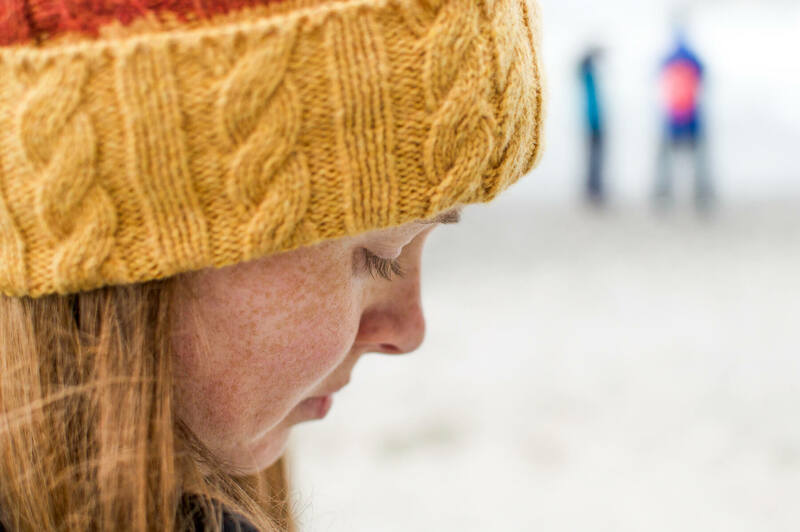 From about 8 AM onwards, the entirety of the ship’s passengers were out on their decks; taking photos, gasping with disbelief and shivering in the blistering cold. We headed through the inlets towards the major Glaciers, but also past those that have no names… Of course, one is now named Kate – the best of them all I say. Huge chunks of ice floated past our ship, sea otters floated past on their backs and mountain goats were spotted in the distance. 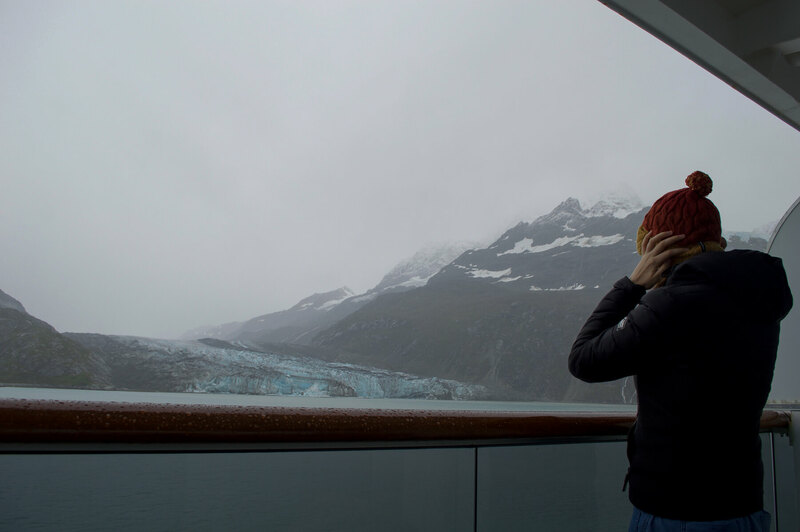 We came to John Hopkins Glacier where we were able to board the bow for a closer look. The ship slowly turned on its axis allowing all passengers to have an opportunity for prime viewing. We headed back out of the inlets, passing more glaciers and icebergs before moving on to the other major glacier, Marjorie. And boy was she a beauty! Marjorie was huge; rugged and mountainous with an edge that looked as sharp as a knife. We stayed here for almost an hour, waiting for the ice crash in the water, watching the birds fly around the caves and observing it’s beauty in all ways that we could. I was in love! If you ever have the chance to spend a day in Glacier Bay – I honestly couldn’t recommend it enough. The ship slowly spun, allowing all passengers to once again, take in all of its glory. We headed out of the park, bid farewell to the Rangers and headed back out to sea. A few Orcas popped up to wish us goodbye and we buckled down for 4m swells… Seasickness tablets certainly came in handy. Free tablets were offered at the desk for all those worried about what was to come. I took 4 tablets in about 6 hours and woke up feeling like my stomach was going to come out my mouth – Gnarly! 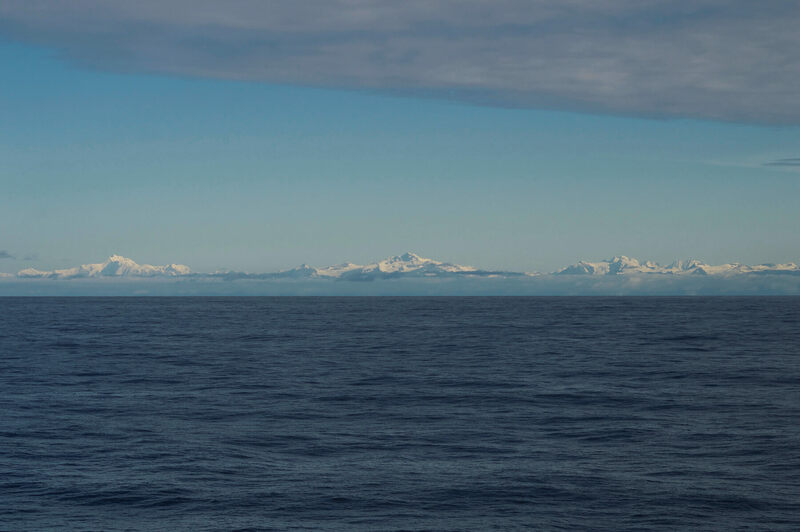 Today was a day at Sea; the Gulf of Alaska. A free day to explore the ship, pack up all our belongings and enjoy the last full day on the ship. Wildlife sightings were frequent, along with amazing views of the distant mountain ranges. This was the last time to enjoy the final day of holiday (not for me thankfully) and to indulge in the free food and activities. luggage was to be placed outside the stateroom door by 12 AM-midnight, ensuring a smooth transition for disembarking. We ate a lot on our last day onboard, you’ve got to embrace the last opportunity for free food, right? Not to mention the $12.50 per day that was automatically charged to your onboard account for tipping. I think that was the best part! Not having to worry about having the right currency, enough change and how much to give when tipping was a huge bonus. – Aussies are not the best at tipping, we’re not exactly used to it! The last day arrived, and what a cold and dreary day it was! We reached Seward in the early hours of the morning and today was the day we all made our way to Anchorage for onward journeys. 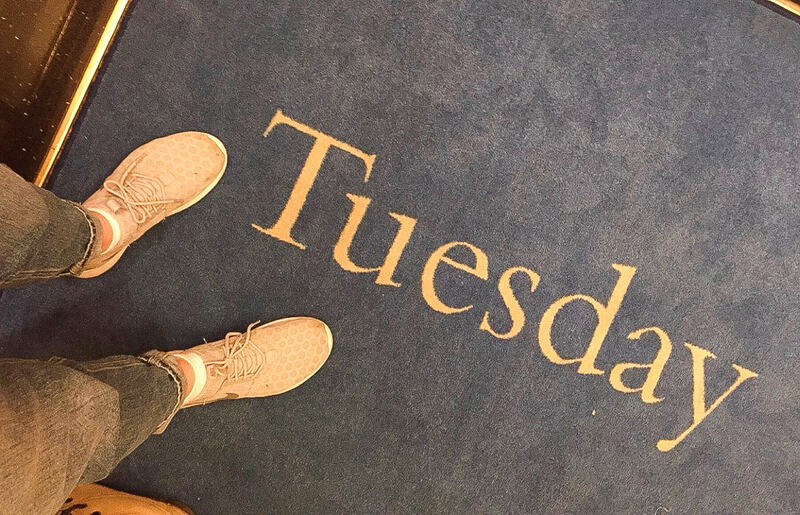 We were given a wave number, which is basically the time of day in which we needed to depart the ship (it makes it a lot easier for the staff and prevents massive congestion in the small hallways). 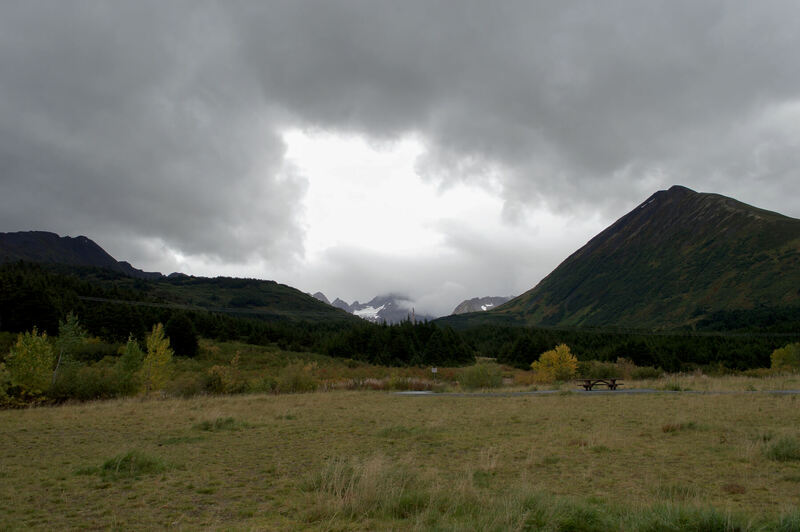 We decided to make the most of the activities and decided to do a Glacier Hike – We drove into the Kenai Fjords National Park for a short “hike” (I would call it a hilly walk) in the rain up to the face of ‘Exit Glacier’. We were in bear country, so we, of course, were on the lookout for our final opportunity to see some Alaskan Bears! Unfortunately, none were spotted but I will always remember a sign on the entry that said “Remember, if a bear tries to eat you… Fight back“ – a very important tip haha! 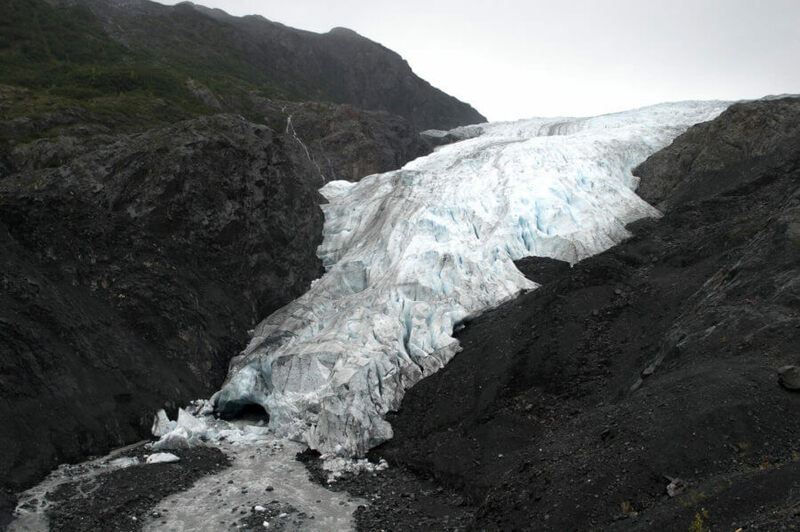 The hike took us right up to the face of this glacier which is receding at alarming rates. It was one of the only glaciers I had seen from this trip so far that had this much water gushing from beneath it. It was huge, but nothing compared to what it had been as little as 5 short years ago. It was beautiful, but alarming was the word I would associate with this tour. 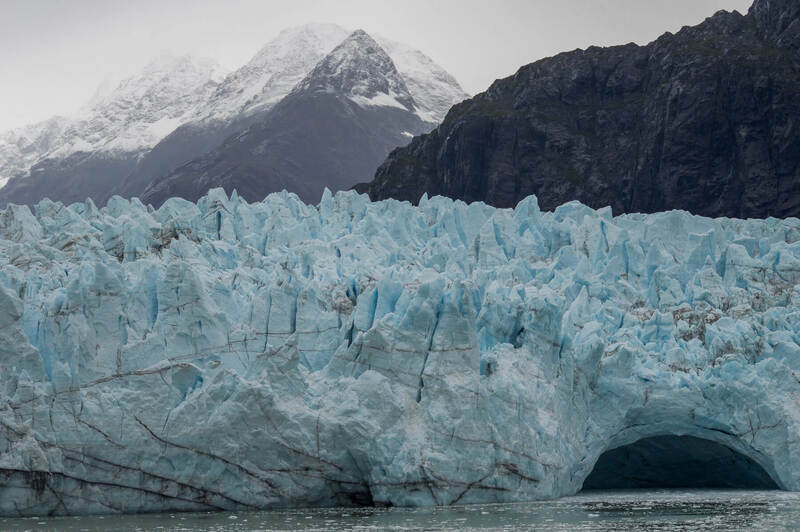 We received so much information about the concerning weather conditions and warm temperatures that are causing this glacier to melt. It was fascinating, beautiful, but so very heartbreaking. After our last tour associated with Ms Noordam, we boarded a bus and spent 2.5 hours driving through the beautiful valleys, around lakes, forests and huge mountains in the Alaskan countryside. Our bus driver gave us so much information about all we were passing, and we even stopped at a beautiful valley to stretch our legs and take some amazing photos. The last leg of the journey was through the Turnagain Arm where we spotted Beluga Whales (Amazing) and observed the sea by land – it was super interesting considering we had been observing the land by sea for an entire week. We were dropped into the city centre where I quickly discovered only one of the bags were waiting for us. After a little bit of chaos and confusion, the bag was found and delivered to us in time for our flight (thank goodness). The colour code on the bottom of the tag had somehow been ripped off, so the bag handlers had no information on where to deliver it – a simple mistake! Luckily we received it on time and our 3 more weeks of travel were thankfully undisturbed. Hooray! All in all, I had the most amazing time onboard Ms Noordam, on my week north-bound journey to Alaska. The entire cruise, including initial purchase and onboard expenses, cost around $4500 AUD (not including flights). It’s not a cheap way to travel, but it was so very worth it. Staff were unbelievably helpful, accommodating and understanding. All food was delicious, activities were 10/10 and best of all, the sights we were treated too would not have been possible by land. Alaska is a place I will always cherish; it taught me so much about the opposite (freezing) side of the world. It showed me so much beauty whilst confronting me with things we should be trying our hardest to avoid. No matter how you decide to travel Alaska, the journey through this state will treat you to sights and experiences that you’ll surely never, ever forget.